"Eclipso Rising" - Part 1: "Shadow Warriors"
At a time of grave crisis, the world's greatest heroes banded together as the Justice League of America. The roster changed over the years; but the mission stayed the same, to combat evil. Our story begins seven weeks ago, on Diablo Island. Bruce Gordon hunts for the corpse of Mophir, the tribal sorcerer who once wounded Bruce with a black diamond and caused him to transform into the satanic being known as Eclipso. Bruce Gordon is hoping that by returning to the spot where that attack occurred, and reconnecting with the past, he can get some inspiration to help him bring Eclipso down. Gordon hides from the natives, who would kill him to eliminate the threat of Eclipso. The natives are not aware that if they kill Bruce Gordon, Eclipso will just find a new host body. Until now, Bruce Gordon's transformations into Eclipso always occur in the presence of an eclipse. But now, while Gordon talks to his fiancé, and without an eclipse in sight, Gordon again turns into the evil Eclipso, who crushes the cell phone in his hand. We are reminded that Eclipso is older than antiquity. We follow Eclipso's thoughts as he reminisces about the first time he possessed Bruce Gordon; when he transferred from Mophir to Bruce Gordon as Mophir died from a fall. Eclipso asserts that of all the men, women, and beasts that have served as his host down through the ages, his connection to Gordon is strongest, making him the perfect host. As he entertains those thoughts, Eclipso gets a rare treat; he is able to converse with Bruce Gordon directly, while occupying his host body. The two banter back and forth. Eclipso confronts the native tribe, and kills its members viciously and mercilessly; incinerating one and decapitating the others. Eclipso's thoughts continue, as he recounts when he possessed, in succession, Alex Montez and Jean Loring, the ex-wife of Ray Palmer, the Atom. Eclipso recalls the time he possessed Superman, and battled Captain Marvel while using Superman as his host. Eclipso leaves Diablo Island and heads to Opal City. Two days later, he confronts the Shade and recruits him for his evil plan. He is able to control Shade and conscript him as a loyal servant. (When someone is under Eclipso's spell, you see a bluish mask covering about two-thirds of that person's face, suggesting an eclipse.) Eclipso next heads to Nightshade, and controls her in the same fashion. After that it is Andrea Rojas a.k.a. Acrata. All three have shadow abilities, which is what Eclipso is looking for. Shadow Thief is next. And then others, all having shadow-related powers. At Emerald City on the dark side of the moon, Alan Scott lies in a makeshift hospital bed. He does not look like himself at all. He is completely bald, and is scowling in pain or discomfort. We know he has been injured, because Jade mentions this. She is at his bedside vowing to help heal his injuries. Arriving at Emerald City, Eclipso indicates that he is looking for one more to add to his collection of followers: Jade. Story - 2: This was a rather off-beat issue. The Justice League hardly appears. The first two pages show images of the JLA that serve as kind of an introduction, but are not really part of the story. Other than that, we have one panel with Jade and Jesse Quick at the bedside of Alan Scott, on the final page. This issue is all about Eclipso. It serves as a history lesson for those who are not familiar with the villainous Eclipso; and detailed reminders for those who are. I had a mixed reaction to this unusual story. The first half of this story is an excellent introduction into everything you ever wanted to know about Eclipso. I found it to be interesting and entertaining. But to be honest, when Eclipso left Diablo Island and began collecting villains to add to his team, the story started to drag for me. This comic really lost my interest about halfway through. I am a big fan of James Robinson. His stories are both thoughtful and thought-provoking. He writes character-driven stories, and loves to pull in disparate elements from throughout the DC Universe. But sometimes, when choosing those elements, his choices can be rather obscure. After Shade, Nightshade, Acrata, and Shadow Thief, Wikipedia had no listing for the remaining three villains. And if Wikipedia doesn't know you, well that's pretty darn obscure. And there was very little explanatory text, as if Robinson expected me to know all about Syththunu, a giant, sentient, black-and-white octopus-like being with dark powers and a very unusual name. (That is not a typo; the name includes a double "th".) Eclipso says that Syththunu was once feared, but now rests forgotten. Indeed. I was in fact intrigued by the idea of putting together a team of shadow-based villains; and was surprised that Eclipso found so many. I just thought the execution was less interesting than the concept. Overall, I thought the quality dipped a bit this issue. But I have a lot of faith in James Robinson. I expect that in the next few issues, he will fill us in on the missing details, and weave a tight narrative. I also expect that this story will get very interesting once the Justice League is involved. Art - 3: Just like the story, I had mixed feelings about the artwork. This is the first issue with penciller Brett Booth. He has a tough act to follow; since Bagley did an outstanding job on this title, in my opinion. There are some great images here. I love the full-splash shot of Eclipso on the title-page. It is nicely detailed and well-drawn, and captures the menace and power of the villain. But on page one; Superman's face just looks "off", as if bumpy or choppy. The jury is still out. We will see if Booth settles in and becomes a strong artist for Justice League. Cover Art - 4: I like this cover. It is nicely laid out. 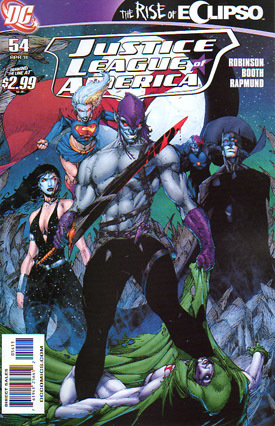 Front and center, there is a large circle suggested by Eclipso's arms and shoulders, Spectre's garments, and Donna Troy's right arm and shoulders. The circle creates implicit movement as your eye quickly dances around that circle, giving some dynamic tension to the image. As I looked at this image, I was drawn to that circle first, and then noticed the blood on Spectre's torso, and the blood on the sword. The menace of Eclipso is captured rather well. The presence of nighttime colors suggests the shadow theme inside. Cover Art (Variant Edition) - 3: This unusual cover by David Mack fits nicely with the unusual story inside. This appears to be a portrait of Eclipso, although it is a little hard to tell. 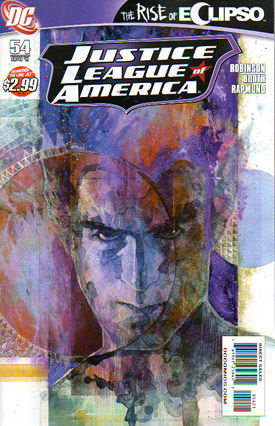 This cover was probably rendered using watercolors; and is a rather abstract image. I like this artistic cover; but really prefer the original.